EcoClean has four convenient locations. 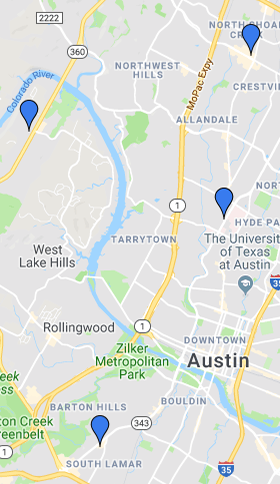 We also provide free pick-up and delivery of eco-friendly dry cleaning to all of these great Austin neighborhoods. Wet cleaning, not dry cleaning. You should try the difference. Either log in to your EcoClean account or create a new account if you do not already have one. Verify that your account information is correct including your contact information as well as your service payment information. Set your bag in the designated area for your delivery driver. You can use our free laundry pickup app Monday through Friday just like our traditional pick-up and delivery scheduling methods. You can expect your clothes to be dropped off just two business days after they are picked up. However, we do understand that there are clothes cleaning emergencies for big events or unexpected circumstances. If you need your laundry or dry cleaning items in a jiffy, simply make a note on your order in our laundry service app.